What kind of Guitars does James Iha use? Click here to let us know! A Gloss Red 1994 Gibson Flying V was used by James in the MCIS era. One of the most notable photographs of James with this guitar was on the cover of Guitar World magazine from December 1995. In that photograph, you can see James has an Electro-Harmonix Small Stone (Version 2) taped to one of its horns. In this photo, found on this fan site, James Iha can be seen holding his Epiphone Casino. In this photo, found on this fan site, James Iha can be seen playing a Fender Telecaster. 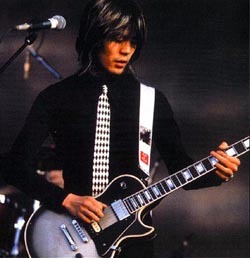 James Iha can be seen playing a Epiphone Doublecut ET-270 in this photo. In this video of a Smashing Pumpkins concert in Dusseldorf, Germany, Iha can be seen using a black Rickenbacker 360 during their performance of "1979" (around 1:00:33 in the video). A nice profile shot of the Rickenbacker can be seen before they play the song from about 1:00:18 to 1:00:22 in the video.  2-pickup solid-body electric guitar, introduced in 1966. Used by James in the Rocket video, also appears in the back photo of Pisces Iscariot (behind the CD). Teisco also made a K-3L and K-4L model with 3 & 4 pickups, respectively. James played a Fender Electric XII (12-String) guitar with a rosewood dot inlay neck for the song "Try Try Try" during the final Smashing Pumpkins tour in 2000. Dot inlays (opposed to block inlays) were only used from 1965 to mid-1966 for this model of guitar. The color appears to be Lake Placid Blue that has aged over time (yellowed) into an interesting green color common for older models. James has a number of Gibson SGs. One is TV Yellow with a white pickguard and one is black. A black version was used during the Siamese Dream tour and has been seen on the Machina tour as well used for C-tuned songs. The yellow was a 30th Anniversary model (only 300 of which were made in 1991), appears in the Cherub Rock video, and was sold by James in July 2010. A red model was seen on his 2012 solo tour for Look to the Sky. In this photo, Iha can be seen playing the Gibson SG Junior. In this photo, Iha can be seen holding the Martin D28. This photo was taken in studio, which could've meant that he recorded something with the guitar. In this photo, Iha can be seen playing the Gibson Les Paul Custom Silverburst, which is capoed at first fret. In the gallery of Iha's performance at Fuji Rock Express 2014, he can be seen playing the Gibson J-45 with soundhole and capo added. In this photo, taken at the 2012 performance in Bush Hall, London, Iha can be seen playing the Fender Sonoran SCE. In this photo, taken at Iha's 2012 performance in World Cafe in Boston, Iha can be seen playing the black Guild Starfire V.
One of the guitars James is using on the current Pefect Circle tour is a Yamaha Revstar. Based on the photo (4th from left) in this Premier Guitar rig rundown its a well worn, top of the line RSP20CR in brushed black with the pickup covers removed. James is seen playing a Jazzmaster in the music video of 'Zero'. James Iha can be seen holding a Stratocaster ready for next song when promoting the band in 2:09:00. What kind of Amplifiers does James Iha use? Click here to let us know! For more mid-ranged gained out tones, they use an Orange Overdrive 120 head & cab. James has used it live as a poweramp for his rack. For some different distorted tones, James has used a Mesa TriAxis all-tube pre-amp, which has 8 pre-amp modes, MIDI control, etc. James used a Fender Twin Reverb amp on MCIS, which was used on some tracks for the cleaner tones. James Iha's gear is on Equipboard.